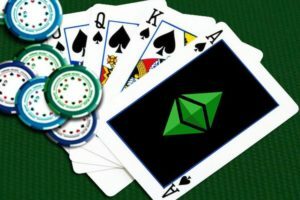 The once popular gambling dApps (decentralized apps) based on the Ethereum (ETH) network are no longer massively used by crypto bettors, a new report from the Diar research unit shows. According to new statistics, those who use cryptocurrencies to gamble online are rapidly leaving the Ethereum blockchain and moving on to dApps supported by other coins like TRON and EOS, despite both types of applications still not being as safe as Bitcoin gambling platforms. According to Diar, across all three dApps protocols, EOS and TRON (TRX) dApps are currently responsible for a total of 94% of all USD transactions, the Next Web reports. The shift towards other altcoins reportedly began around June 2018 when Ethereum and EOS-based dApps were still toe to toe. But from that point onwards, Ethereum has been losing its dominance rapidly to the two alternative cryptocurrencies. Currently, 55% of the USD traffic on all three protocols is from EOS users while an impressive 36% is coming through TRON-based apps. These statistics wouldn’t have been that much peculiar if it weren’t for the fact that most of this traffic is due to gambling. According to historic data, since the EOS network was launched last year it processed over $5.5 billion in coins, around 70% of which were attributed to dApps related to online gambling. The TRON network had an even more impressive run, with 95% of its traffic being tied to gambling. For comparison, gambling Ethereum-based dApps now only account for 2% of the total USD volume of the network, despite the fact that almost half of the decentralized applications developed for the ETH blockchain are gambling-related. As the research found, most of the USD traffic on the Ethereum network currently comes from trading coins on online exchanges rather than gambling. According to statistics, cryptocurrency exchanges, along with other ETH applications, account for 25% of the traffic – a percentage even smaller than that of other ETH online games which account for a total of 28%. One of the surprising things about gambling-related decentralized apps on altcoin networks is that they remain popular despite previous security incidents. Back in September, not long after EOS was launched, a coding failure allowed a hacker to exploit a dice game on the DEOSGames website and bank 24 individual jackpots of $1,000 each. Shortly after, hackers attacked another dApps website EOSBet, stealing away $200,000 worth of EOS coins, only a month before another group ransacked the same platform for $300,000. All these incidents just go to show how far do other cryptocurrency gambling platforms have to go before they reach the level of trust and security that Bitcoin casinos now enjoy. For years there haven’t been any hacks of Bitcoin casino operators that stole away player’s hard-earned coins, which is why BTC gambling sites are still a go-to choice for many online gamblers, including both sportsbetting fans and those who are looking for some slot or table action.